Jerome Farmers Market: Market Recipes: Cherries!!! We will be selling fresh cherries at the Market tomorrow. 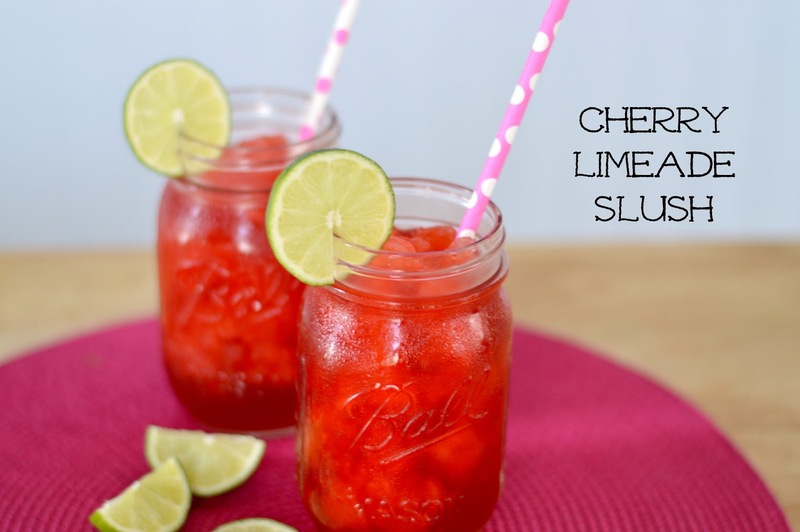 This Cherry Limeade Slush is kid-friendly and perfect for summertime. It's so simple to make, the kids can help! ADD real cherries cut in fourths or pureed cherries for extra yummy flavor! In a blender, pour ice, Sprite, juice of one lime, and Cherry Kool-Aid Liquid. Pulse about 10 times to break down the ice. Blend on a low setting for about 5 minutes until ice is still somewhat clumpy, but completely crushed down. Garnish with lime slices, and serve with a straw and a spoon. Heat the olive oil in a saucepan over medium heat. Cook the onion and garlic for about 3 minutes, or until softened. Add the cherries and cook until they're heated through, about 2 minutes more. Add the Dijon, tomato paste, maple, vinegar, chili powder, and cumin. Stir to combine. Allow sauce to simmer, stirring often, for about 3 minutes. Season to taste with salt. Remove saucepan from heat and use an immersion hand blender to puree mixture to a smooth and thick sauce (or transfer mixture to a food processor or blender to puree). Meanwhile, mix crumbled chocolate wafers, 1 cup granulated sugar and butter in a small bowl, until completely combined. Press wafer mixture into the bottom of a 9-inch removable bottom cake tin (with 3-inch sides) to form a “crust” with a 1- to 2-inch outside edge. Set aside. In a large mixing bowl, cream 1 cup sugar and cream cheese until fluffy. Add ¼ teaspoon lime zest and continue beating until mixed through. Add cream cheese mixture to white chocolate mixture that has cooled. Mix together with a large spoon or spatula, until completely combined. Set aside. In the bowl of an electric mixer, beat 2 cups heavy cream until light and fluffy, about 1 to 2 minutes. Carefully fold whipped cream into the cream cheese-white chocolate mixture, to fully combine while being careful not to deflate the whipped cream too much. Pour mixture into chocolate wafer crust. Cover with plastic wrap and place in freezer for 24 hours. Heat water and remaining 2 tablespoons of granulated sugar in a saucepan over medium high heat (to create a simple syrup), stirring frequently until sugar is completely dissolved, about 1 minute. Remove pan from heat and let cool. Once cooled, mix simple syrup and cherries in a bowl until cherries are nicely coated. Then place a fine mesh strainer over a second bowl and pour cherries into strainer. (This will remove excess syrup from cherries. 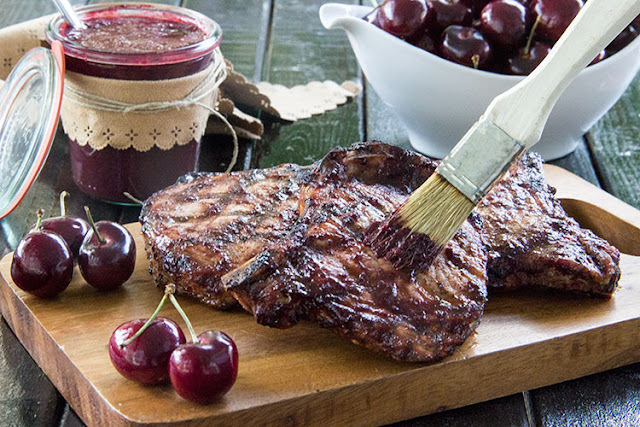 You want cherries to have a subtle glaze but not be “wet.”). Remove icebox cake from freezer about 15 to 20 minutes before serving. Remove outer ring of cake tin to “un-tin” cake and place cake on a serving dish. 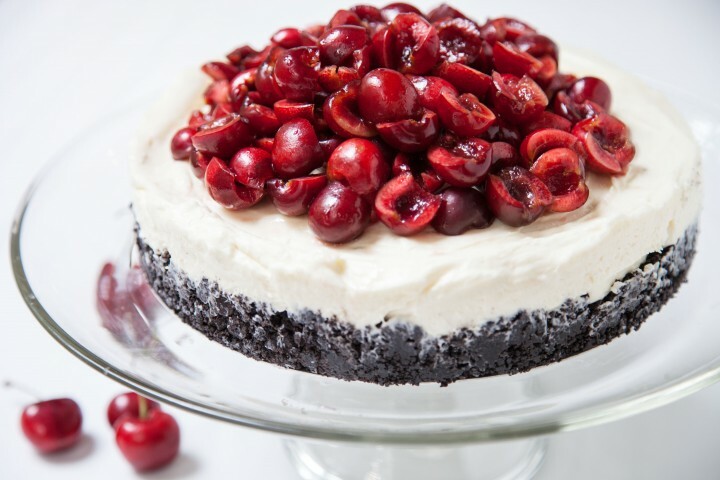 Top cake with a tumble of glazed cherries and serve immediately. Per Serving: Calories 792 (55.8% from fat); Fat 49.1g (sat 32.7g, poly 2.2g, mono 10.6g); Protein 8.9g; Carbohydrates 79.5g; Fiber 1.6g; Sugar 65.2g; Cholesterol 111.4mg; Potassium 217.8mg; Sodium 332.6mg. See you tomorrow at the Market from 9am-1pm!